MY DISH-WASHER IS DEAD!! WOE IS ME!!! And you know what's really galling? The mechanics work fine - it washes fine, dries fine - functions, quoi. BUT some weird and wonderful gadget called an AQUA STOP has decided it's paid enough into the retirement kitty and has downed tools. I ask by what right does it think it can sabotage my dish-washer? It just looks at me stoically and tells me to consult it's union representative, that 6 or so loyal years of service is quite adequate and that I should be grateful it didn't take action and go on strike earlier for making it cope with such hard water. I do actually have an Ekeo water softener but we all know how efficient THAT is haha. The machine still works but the AquaStop is preventing water being pumped in. I can't cut it off either because these things are all wired up with security measures and will implode if you so much as wave screwdriver at it let alone approach menacingly with a wire cutter. So it'll be all hands to the washing-up deck until I identify a likely candidate to replace my lovely Siemens. I'm planning one-pot meals and will certainly resort to a bumper pack of paper plates before long. 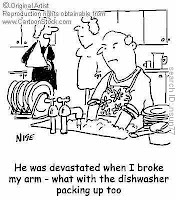 A dishwasher was the one thing I insisted I needed when I ceased to be a working woman. Becoming a mother of two demanded a tumbledryer. For what it's worth I have a Bosch logixx but would admit I generally use only the eco wash or the quick rinse so having a multi functioning m/c is wasted on me. Good luck! If you have a chummy plumber I'm sure he could get rid of that Aqua Stop system ... my dishwasher had one years ago but subsequent ones don't have them - it was there to stop the dishwasher overflowing, wasn't it? I have NEVER known a dishwasher to overflow! Brilliant idea, DD!! I will try that before I go dish-washer hunting any more. I toss pancakes. ... well, I did last month, when the better half asked for crepes (sorry - can't find the e-circonflex key!). I was in the middle of a spectacular toss when it became more spectacular than planned - the handle stayed in hand, and the crepe sailed off in exactly the right direction with good spin ... but the pan decided to take up flying too, left the handle with me, and went for a spin too. Result: pan on floor, crepe on washing machine, and a lot of voluble cursing from yours truly! Now I have a new crepe pan; 10" and cast iron/non-stick. Such bliss! That sounds like a pancake story you won't forget in a hurry, Mike! I bought a new pan too the other day. It didn't look that big in the shop, but it looks huge on the hob! Thanks, anon, I will certainly check them out! !